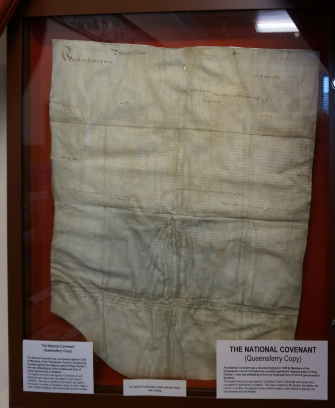 The Queensferry copy of the National Covenant is on permanent display in the Queensferry Museum, which is located on the upper floor of the council offices. Access to the museum is free. The museum is operated by Edinburgh City Council and is open on Monday, Thursday, Friday and Saturday. To double-check opening times, etc., please click here to access the museum's website. The Queensferry copy of the National Covenant was signed by the burgh's two baillies, the council, a number of burgesses (some of whom made a mark instead of signing), the local schoolmaster and the parish minister.